1. "If a mechanic offers to change your timing belt and water pump, question how long the job will take. Some will charge you double labor even though the second task is essentially done once the belt is removed." 2. "Always ask for your old parts back. This way you'll know they've been changed, and you or a friend can tell if they're worn." 3. "Be careful with "road hazard" warranties on tires. The shops may give you a free tire here and there, but eventually they will soak you with unnecessary alignments or suspension replacements." 4. "All brakes are not equal; ask for estimates on brake jobs. Many mechanics will use very cheap parts and mark them up. Good mechanics who understand cars will never skimp in this area." 5. "Remember to have your car test-driven. A good test-drive is just as important as a regular service -- it might mean the difference between simply needing brake pads and having a complete rotor replacement." 6. 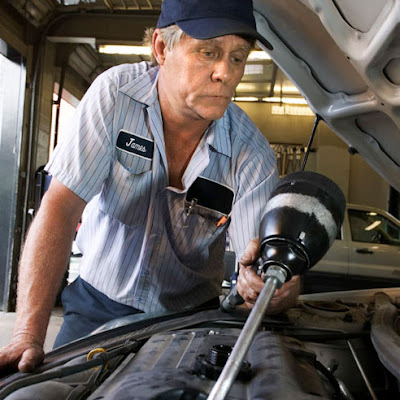 "Good mechanics, like good customers, are hard to find -- communication is key. A good mechanic will explain repair phases and give you choices." 7. "Be wary of certified pre-owned cars. Usually in this business the only thing that's certified is that someone owned the car before you. Very little ever gets done on these types of cars." 8. "Don't bring your car in on Friday afternoon, because the mechanics might rush the job to get out for the weekend." 9. "Beware of a mechanic who shows you a transmission pan with metal particles in it, and recommends a major job. The shavings are usually a sign of normal wear." 10. "Before buying new tires, know what your state's tread specifications are. Then have the mechanic measure the old tread with a gauge." 11. "Watch out for ads promising $100 brake jobs. No mechanic can make money on that." 12. "Transmission flushes are one of the biggest scams going. Manufacturers don't recommend them, and your car almost never needs one." 13. "The market is being flooded with cheap parts from China. Request a name-brand replacement and ask to see its box."